If Queenstown was a hyperactive, attention-seeking child, Wanaka would be the laid back sibling that quietly plays with its Lego in the corner. We’re not saying that Wanaka is boring, far from it, but while visitors flock to nearby Queenstown for the energy and excitement, Wanaka is all about relaxing and enjoying the beauty of nature. Wanaka has everything you’d expect from a holiday town. It has a picturesque lake, mountain views and a bustling little waterfront filled with cafes and bars. There’s also plenty of year round outdoor action, both on the water and in the surrounding mountains, valleys and canyons. Yes, Wanaka is an awesome adventure destination, just a little more understated than its neighbour. Here are approximate travel times and distances to and from Wanaka. 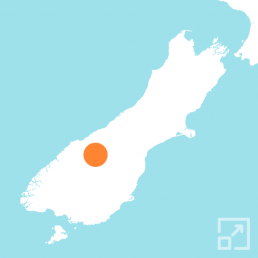 The nearest airport is in Queenstown, approximately 1 hour 10 minutes drive from Wanaka. Wanaka has always been a popular summertime destination with warm, long days and little to no humidity. That makes it perfect for outdoor activities, particularly kayaking, paddleboarding, wakeboarding and canyoning. The average high in summer (December – February) is 23 °C / 73.4 °F and the average summer low is 10 °C / 50 °F. In Autumn (March – May), the weather is calm and settled and while the days are still warm, mornings and evenings are noticeably cooler. The average temperature in Wanaka in autumn is 16 °C / 61.8 °F. Being at the foot of the Southern Alps, it should come as no surprise that winters are cold. The good news is that it’s ski season, with early snow transforming the mountains views. The average high in winter (June – August) is just 9 °C / 48.2 °F and the average winter low is -1 °C / 30.2 °F. Spring (September to November) sees the return of warmer and longer days but there’s still snow on the mountains with ski resorts still open until mid-October. The average temperature in Wanaka in spring is 17 °C / 62.6 °F. Looking for ideas to help you plan the ultimate New Zealand outdoor adventure? Here are some of the top things for active travellers to see and do in the Wanaka region. The Roys Peak Track is undoubtedly the most popular walk in the Wanaka area and for good reason as it offers some of the best panoramic views of Lake Wanaka. It’s a relatively tough climb to the 1,578m summit and at 15 km / 9 miles return you’ll need to allow 5 – 6 hours. You can read about our visit here at Walking the Roys Peak Track. Heading out towards Treble Cone and just before the turn off onto the ski field access road is a spectacular pair of waterfalls, aptly named Twin Falls. They’re on private land and so not accessible unless you’re up for adventure in the form of a via ferrata waterfall climb with the team from Wild Wire Wanaka. They have options for every level including both beginner and intermediate climbs. Where there’s a lake, there’s usually an opportunity to paddle. Lake Wanaka is no exception and the team at Paddle Wanaka will have you on the water in no time, either kayaking or standup paddleboarding. This is New Zealand’s third largest national park covering a large area of the southern end of the Southern Alps. The same road that takes visitors towards Treble Cone, continues up the Matukituki Valley to the start of several challenging multi-day hikes. There are also a number of shorter walks in the area including the popular Rob Roy Glacier Track. For an experience of a different kind, try packrafting with Wanaka River Journeys. A jet boat ride up the Matukituki River followed by a short walk will get you to the start of your journey back down the river on inflatable rafts. A great way to experience this turquoise river and the surrounding mountain scenery. Treble Cone is located in the Harris Mountains, just less than 30 km / 19 miles west of Wanaka Town. This ski field boasts one of the largest skiable terrains in the South Island with long uncrowded slopes and spectacular views over Lake Wanaka. Although there is some beginner terrain, Treble Cone is better suited to intermediate and advanced skiers and snowboarders. You can find out more on the official Treble Cone website. For more ideas on things to do in and around Wanaka check out Wanaka tours, tickets, activities & things to do.